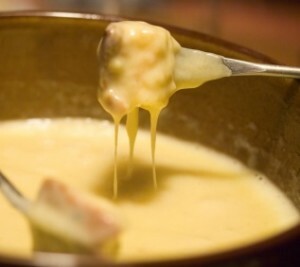 Cheese Fondue: Cheese Fondue is a Swiss, Italian, and French dish of melted cheese served in a communal pot (caquelon) over a portable stove (réchaud), and eaten by dipping long-stemmed forks with bread into the cheese. It was promoted as a Swiss national dish by the Swiss Cheese Union (Schweizerische Käseunion) in the 1930s. Rub the inside of a 4 liter pot with the cut garlic and then discard the garlic. Place the shredded cheese and cornstarch in a plastic freezer bag. Seal, shake to coat the cheese with cornstarch. Add the wine and lemon juice to the garlic coated pot. Bring to a low simmer on medium heat, do not let it boil. Bit by bit, slowly stir the cheese into the wine. Stir constantly in a zig-zag pattern to prevent the cheese from balling up. Stir in kirsch, mustard and nutmeg. Transfer the cheese to a fondue serving pot, set over a low flame to keep warm. Arrange various dipping foods around the fondue pot. To eat, spear dipping foods with fondue forks or small forks. Dip to coat with the cheese, and eat. If your fondue pot is thin-bottomed, a lit candle will probably do. If thick-bottomed, you can use a small Sterno.